1. Download the Touchstone-Pro For MacOS disk image (*.DMG) file to your Mac laptop machine. 2. Using ‘Finder’, mount the disk image under ‘Devices’. 3. To install the application on your machine, drag the icon for Touchstone-Pro For MacOS over the icon for the Application folder. 4. To install the Silicon Labs driver, click the icon for the driver package — which will launch the Mac’s Installer app. Simply click through all the steps by pressing ‘Continue’ (or the equivalent). The Touchstone-Pro For MacOS application is now ready to use. If an RF Explorer device is attached, then the first time you launch the application you will be prompted to enter your email address and a license key. Thereafter you will not again be prompted for this license key. However, to run the Beta version your machine needs to be connected to the Internet. This allows the application to validate your installation with a remote license server. If you launch the application without attaching an RF Explorer device then the application will ask whether you would like to continue in ‘demo’ mode. In demo mode the application is fully functional, with the exception it uses simulated data. 1. Download the Clear Waves For MacOS disk image (*.DMG) file to your Mac laptop machine. 3. To install the application on your machine, drag the icon for Clear Waves For MacOS over the icon for the Application folder. The Clear Waves For MacOS application is now ready to use. If an RF Explorer device is attached, then the first time you launch the application you will be prompted to enter your email address and a license key. Below is a link to RF Explorer’s user manuals. The manufacturer is constantly adding new features to RF Explorer, therefore newer firmware versions may have additions and changes not yet included in the User Manual. Below is a link to the user manual for the RF Explorer Signal Generator (model RFE6GEN). The manufacturer is constantly adding new features, therefore newer firmware versions may have additions and changes not yet included in this manual. Below is a link to a YouTube video that shows how to use an RF Explorer spectrum analyzer and signal generator in combination to measure the performance of an RF filter. Below is a link to a YouTube video that shows how to use an RF Explorer spectrum analyzer and signal generator in combination to measure the VSWR / return loss of an antenna. The first time the software application launches it checks for the presence of the RF Explorer device. 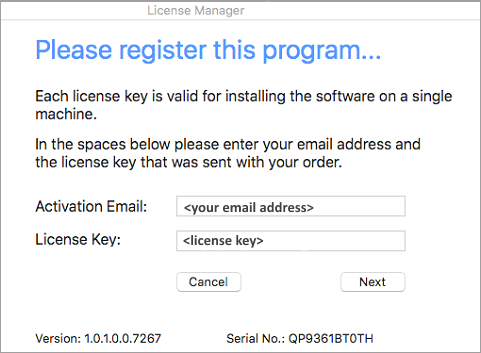 If the application detects the device then it prompts for the corresponding software license key. If the application does not detect the device then it runs in demo mode. If the Silicon Labs software driver is not properly installed then the application will not detect the RF Explorer device. If the Silicon Labs software driver appears to be properly installed yet the application still does not detect the RF Explorer device then there are 3 additional settings you should check on the RF Explorer device. These settings affect the communication between the RF Explorer device and the application software running on the Windows PC. 1. Make sure the RF Explorer is actively scanning — that is, you did NOT press the ‘Menu’ button and are NOT navigating the built-in menus via the LCD screen. 2. The USB Baud rate is set to 500 Kbps (and NOT 2.4 Kbps). 3. If your RF Explorer device supports a ‘WiFi Analyzer’ mode then make sure it is not currently using that mode. For the application software to recognize and communicate with your RF Explorer device a software driver is required, and in this particularly case it is the software driver from Silicon Labs. 1. Install the application software — drag the icon for the application to the icon for the Applications folder. 2. Install the Silicon Labs driver — click on the icon for the Silicon Labs driver. After installing both the application and Silicon labs driver you can then attach the RF Explorer device to your MacOS machine. To verify the driver is installed, open a Terminal window and navigate to the directory ‘/dev’. When the RF Explorer is attached, then the MacOS will load the correct driver. The name of the driver is ‘/dev/tty.SLAB.USBtoUART’. When you detach the device then the MacOS unloads the driver and that file no longer appears. 1. Make sure the RF Explorer device is actively scanning — that is, you did NOT press the ‘Menu’ button and are NOT navigating the built-in menus via the LCD screen. 4. Ensure the driver is properly installed (see above). 5. Bad USB cable — it does happen a lot. Not all USB cables are created equal. The application requires a USB cable that supports *BOTH* data and power. Some USB cables only support power. 6. Bad USB port — try a different USB port or MacOS machine. When it comes to measuring or detecting radio signal transmissions and RF energy then an RF spectrum analyzer is the tool of choice — in fact, it is the only tool. Often times a user will immediately begin using the device to solve a wireless problem, and when they don’t observe what they think is the expected result they may assume there is something wrong with the device. An RF spectrum analyzer is simply a tool — like any other. And your chances of success depend as much on your understanding of the problem you are trying to solve as well as the tool you are using. Troubleshooting wireless issues requires that you be a good detective and it also requires some experimentation. If you approach the problem with preconceived notions of what the expected result should be and your notions are wrong — then you won’t solve the problem. The RF Explorer product line includes several models that differ in the frequency bands they support. Depending on your application, deciding on which model best fits your needs may be an obvious choice or not. Furthermore, it could be more than one model would be suitable. Your choice will typically involve selecting a model that includes a radio module that supports the frequency range or ranges you currently monitor and plan on monitoring in the near future. Radio module #1 supports the frequency range 15 – 2700 MHz; radio module #2 supports the frequency range 240- 960 MHz. Radio module #1 supports the frequency range 15 – 2700 MHz; radio module #2 supports the frequency range 2350 – 2550 MHz. Radio module #1 supports the frequency range 240 – 960 MHz; radio module #2 supports the frequency range 2350 – 2550 MHz. Radio module #1 supports the frequency range 240 – 960 MHz. Radio module #1 supports the frequency range 2350 – 2550 MHz. The Models 3G Combo and 3G-24G Combo both include a wide-band radio module that overlaps with a more narrow-band radio module — the reason for this is best understood by explaining how the devices evolved. Originally there were only narrow-band models — but when the frequency range was extended a design decision was made to “piggy-back” a 15-2700 MHz radio module onto an existing base model rather than start from scratch and create yet another device (which would have been more expensive). Since the 15-2700 MHz radio module includes the frequency range of the other radio module then it can be used for most applications. However, there are times when it is best to use the more narrow-band radio module. For example, if you are trouble-shooting a Wi-Fi problem then you might choose to use the 3G-24G Combo’s 2350-2550 MHz radio module since you will see better performance compared to the wide-band radio module. Similarly, if you are working in the UHF range as an RF audio engineer then you will see better performance using the 240-960 MHz radio module. Also, each radio module uses a different antenna, which will affect the sensitivity in the frequency range you are working in. Choose Model 3G Combo — it covers the most common RF bands. Choose Model 3G-24G Combo — in addition to covering the most RF bands it also includes a 2.4G radio module for better performance when scanning the 2.4G band. Choose Model 3G Combo or WSUB1G — these both include a 240-960 MHz radio module, which is the frequency range used by wireless microphones and in-ear monitors (IEMs). Choose Model ISM Combo — it includes narrow-band radios for each of those bands. However, because it does not include a wide-band radio module then it is less than ideal for general-purpose RF spectrum analysis. If your RF Explorer device is a “Combo” model, then there are two radio modules available. However, only one can be active at a time. To toggle between the two radio modules use the built-in LCD screen and ‘Menu’ key to navigate to the ‘FREQUENCY MENU’. Use the arrow keys to select ‘Module’ at the bottom of the menu and then press ‘Enter’ to toggle between the two radios. The image below is an example from a model 3G Combo, whose two radio modules support the frequency ranges 240-960 MHz and 15-2700 MHz. When the device first boots one of the first screens shows two rectangles that represent the two radio modules. The rectangle that represents the radio module that is currently active is labeled as ‘[ACTIVE]’. 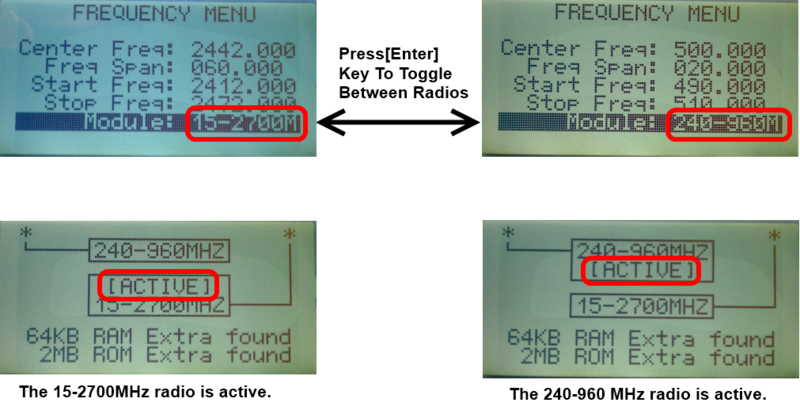 Also, the asterisk (*) attached to each rectangle indicates which antenna is connected to which radio modules. At any time you can review which radio module is currently active by using the built-in LCD screen and ‘Menu’ key and selecting ‘RF Connections’ from the main menu. People often ask why the strength of a transmitted signal is higher using one device compared to another — or why the noise floors differs. The answer is simple — it is not valid to compare absolute values from different devices. The reason is that a variety of factors affect the measurement — e.g. the types of antennas used by the devices, how well tuned the antennas are to the frequency range being scanned, the location, position and orientation of the antennas, the resolution bandwidths used during the measurements, etc. So, unless all these factors are identical for the two instruments, then comparing absolute measurements has little value. The measurement that you make using a particular device is a relative value and only has meaning when using that particular device. So — what to do? The answer is to instead measure the SNR (signal-to-noise) value — that is, the delta (or difference) between a signal’s peak and the noise floor. SNR (rather than absolute signal power) should be used as the evaluation or test metric when comparing different instruments. values can differ significantly, when using the SNR then you get the correct result and can conclude that both devices are working properly. ‘Refresh rate’ or ‘scan time’ are properties of an RF spectrum analyzer related to performance that are obvious and visible. Less visible is the property ‘resolution bandwidth’ or RBW. Though a high ‘refresh rate’ and low RBW are desirable properties, achieving both may not be possible. During the course of product development many choices and trade-offs are made — based on cost, resources, time, and marketing considerations. When designing the Touchstone and Clear Waves software, when a trade-off arose between ‘refresh rate’ and RBW, we chose in favor of RBW. In this post we will explain why — and we’ll use Clear Waves as an example. When comparing the refresh rate of the RF Explorer device with that of Clear Waves the device appears much faster. This is partly machine dependent — that is, Clear Waves is very graphical and several diagnostic charts are repeatedly re-calculated and re-drawn, which takes time. The faster and more powerful your PC machine, then the faster will be the graphical updates. However, the primary reason why Clear Waves appears slower than the device is the software breaks each spectrum trace into many subscans — in order to achieve finer resolution and better accuracy. For example, each Clear Waves trace may actually include data from 390 subscans. When you think about it, fast scanning provides little diagnostic value. It looks good, but it doesn’t change the results. The only instance where fast scanning is valuable is when you are trying to detect transient signals — but then a low-cost, RF Explorer spectrum analyzer is probably not the right tool for that type of application. Clear Waves is designed for engineers who are tasked with assigning channels and coordinating frequencies — so, the quality of the data is more important than how fast the data can be repeatedly displayed. Clear Waves incorporates a proprietary algorithm that performs intermodulation analysis and generates a resultant frequency set. In order to truly take advantage of the intermodulation analysis you need good data. In order to find all the available open space we perform spectrum scans at a higher resolution (lower RBW). Let’s say we settle on an RBW of 50 KHz (which is the default for Clear Waves). RF Explorer collects 224 data points per scan — for the sake of argument let’s round this down to 200 data points per scan. At a scan rate of 200 data points per scan, this means our frequency span can only be 10 MHz if we want an RBW of 50 KHz (since 200 times 50 KHz is 1 MHz). So, what happens when a user specifies a frequency of 470 – 600 MHz — i.e. 130 MHz? This means Clear Waves breaks the work down into 13 subscans, each one 10 MHz in width. In this way, Clear Waves can achieve a very high resolution. Clear Waves also repeats each subscan 3 times — for purposes of accuracy. When Clear Waves completes a scan from 470 – 600 MHz it has actually performed 390 subscans and now has a lot of data to work with — and it is accurate. But all that data comes at a price — refresh rate. To summarize, if we were not using the data for intermodulation analysis, then the extra data and accuracy are less important. But since the RF spectrum is often very crowded and open real estate comes at such a premium, then we want to give the intermodulation analysis as much good data as possible so the resultant frequency set it computes contains as many intermod-compatible channels as possible. (2) Install USB Drivers from Silicon Labs for Windows – 32 and 64 bits. RF Explorer uses an embedded CP2102 USB device internally to connect with the PC. After downloading RFExplorer_USB_Driver.zip then extract and run CP210x_VCP_Win_XP_S2K3_Vista_7.exe.